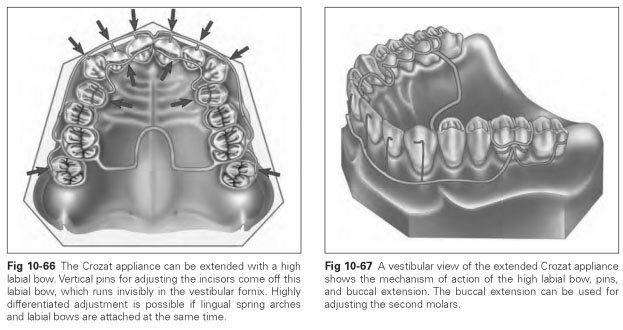 The buccal and lingual extension wires are part of the basic Crozat appliance. Other additional elements can be soldered to these wires without affecting the first solder. The lingual extension wires (lingual arms) take on guidance and corrective functions. The lingual arms are made of 1.0-mm wire and run from the mesiolingual part of the clasp forward over the two premolars. They can lie directly against the premolar contours or only have punctiform contact with a tooth. A precisely fitted lingual arm takes on guidance functions, ensures positional stability, and may support lateral dental arch movements when the body wire is activated. The buccal extension wires made from 1.3-mm round wire profile are mostly fitted in the maxilla and are soldered to the Jackson clasp.They serve as the soldering attachment for additional components and form right-angled short arches to the Jackson clasp without gingival contact. The individual components are bent separately: First the Jackson clasp is bent with the rest and the crescent; then the body wire is bent, followed by the lingual and buccal extensions. These parts are fixed in the correct position on a second model made of soldering investment material and then soldered at the contact points. The soldering points are smoothed, and the appliance is polished. Stresses and strain hardening caused by finishing, polishing, and rebending are eliminated by heat treatment (annealing). Additional elements for Crozat appliances include a high labial bow with pins, hooks and springs, as well as lingual auxiliary spring arches for movement of anterior teeth (Figs 10-66 and 10-67). The high labial bow has a wire thickness of 1.3 mm and is soldered to the buccal extensions in the maxillary appliance. The bow runs outside the visible area in the vestibular space without touching the gingiva. The soldered pins (0.8 mm wide) extend from here to the labial surfaces of the teeth. At the level of the canines, hooks can be soldered on to receive elastics, which pull on the Jackson clasp at the hooks in the maxilla and are used for correcting occlusion. Hooks can also be attached to the high labial bow for elastics so that individual teeth can be rotated. The lingual auxiliary spring arches are the counterparts to the high labial bow on the tongue side. They are bent out of 0.8-mm wire and fitted with additional activation loops. They are soldered to the existing lingual arms and run as far as the middle of the dental arch. Treatment based on the Crozat approach involves several phases, for which the appliance has to be expanded and reworked. Each phase has different treatment goals, and the next phase is only started once the previous goal has been achieved.